What really happened at Hackham Heath that made Halt a hero to the entire Kingdom? This is the prequel Ranger's Apprentice fans have been waiting for. When the former Baron Morgarath escaped to avoid punishment for treason, an uneasy peace fell on Araluen. But the Rangers know Morgarath will be planning his next move, and there are rumours he has recruited an army of savage, inhuman creatures. Newly crowned King Duncan must prepare for war. Halt prepares for a seemingly impossible task - climbing the deadly cliffs of the Mountains of Rain and Night and venturing deep into enemy territory to spy on Morgarath. Meanwhile, Crowley must ensure the Queen's safety as she undertakes her own perilous journey for the sake of her unborn child. Morgarath's Wargals seem unstoppable against Duncan's depleted army. The winner of this war could be decided by one wrong move. At the Battle of Hackham Heath, the fate of a Kingdom will be decided. 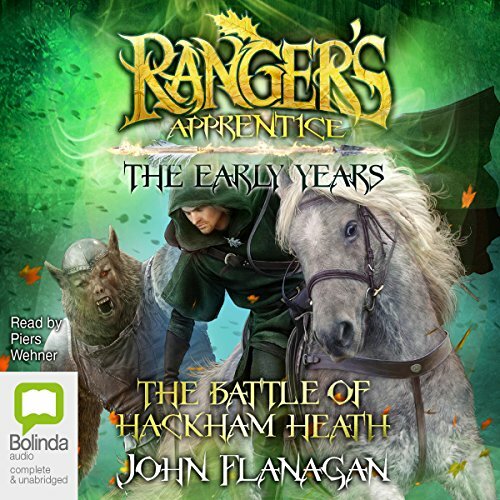 The origin story of how Halt came to be Araluen's most famous Ranger - and how war will decide the future of the next generation - will thrill Ranger's Apprentice fans and new listeners alike. Loved it! I'm a real fan of the Rangers Apprentice and Brotherband series all first class stories, clever humour and inspirational for all! this book has is very good at showing Strategy in battle. it is also a very interesting book to those who have read the rangers apprentice series with will and halt. The very best audio book I have heard. John Flanagan's stories are unforgettable - and the presentation of this particular story is well read, dramatised to make it very difficult to leave. In fact, I am about to begin again, because I still can't 'put the book down ". Thank you for a totally enjoyable experience.